I never thought I would type these words, but “I like Yanni.” That’s right – the original, instrumental, music king and his new Truth of Touch CD have magically worked their way into my musical rotation. 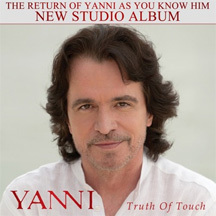 Truth of Touch is Yanni’s first instrumental release of original compositions in over eight years and is a return to the genre Yanni helped create and advance. Before receiving the Yanni Truth of Touch CD, I had never (knowingly) listened to Yanni. Growing up, I had heard the name, but it was always more for the “adults.” Now, 20 years later, I have just heard my first Yanni CD, and I think it is great! Truth of Touch is a compilation of many different types of songs – some purely instrumental, some with vocals, some slow tempo, some fast tempo, but all wonderfully soothing and relaxing. But it’s not so relaxing that it puts you to sleep. It’ll keep you entertained and alert if you want or you can focus on the more chill songs to relax. Yanni’s Truth of Touch is the type of CD that you can listen to all night. It seems like no two songs are alike – one seems jazzy, another one with a hint of latin, and even one that has a bit of a beat. I put the CD on for some guests and by the end of the night, they were all humming along and bobbing their heads to the smooth Yanni rhythms. It’s exciting music that helps keep an entertaining time going. This is definitely a CD that is reserving a permanent spot on my playlist. Yanni Truth of Touch is already out in stores and is available for download or CD purchase from Amazon. If you would like to watch Yanni in person, he is currently on tour. Some of the cities are already sold out (apparently Florida loves them some Yanni) but you can see if tickets are on sale in a city near you. Disclaimer: This post consists of my (and/or fellow tester) opinions only. Your experiences may be different. No compensation was given for this review/giveaway. I did receive a free product as part of my association with One2One Network to use and test for the purposes of this review. This did not affect the outcome of this review.